Nothing screams summer quite like a backyard barbeque. The warm sun, the cold drinks and the smell of cooking burgers and hotdogs wafting from the grill. But after a long summer of fun and cookouts, your grill has taken quite a beating. All the delicious grease and fat that was cooked off the meat has now made itself at home inside your grill. Don't worry though, cleaning your grill is a breeze with a pressure washer. We all know electricity and water just don't mix. So if your grill has an electric starter, make sure you disconnect it before your soak your grill with water. Similarly, if you have a propane grill, disconnect the tank and move the connection hose out of the way to avoid damaging it with your pressure washer. Running across the propane hose with a high-pressure jet stream of water will slice through it, leaving you with a gas leak. If your grill is attached to your home's natural gas line, the same thing applies. Disconnect the grill from the natural gas line before cleaning, and make sure any hoses are tucked away so they don't get damaged. Unfortunately, most of the delicious meats we gorge on all summer long have some fat. And if you've ever washed dishes, you know how impossible it can be to remove grease with without soap. So get a quality degreaser to make short work of the caked on grease inside your grill. Most pressure washer safe degreasers are concentrated, so dilute it per the instructions on the degreaser container. Pour the degreaser into your detergent tank, equip your spray wand with a detergent nozzle, switch the detergent tank to "On," and apply the degreaser evenly over your grilling surfaces, under the lid of your grill, and anywhere else that's caked with grease. Let the degreaser settle for a couple of minutes while you switch your detergent tank to "Off," and switch from your detergent nozzle to a high-pressure fan nozzle. 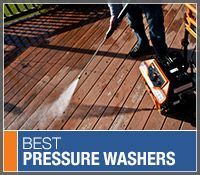 Aim your pressure washer at the ground and squeeze the trigger to flush out any remaining detergent, then spray the grease away from top-to-bottom. Don't forget to spray the underside of the lid clean so it doesn't drip old soap on the next meal you plan to grill. Follow these tips, and your grill will look like new in no time. Three Steps to Cleaning A Grill.. Our Power Equipment Direct how-to library can help you learn about Proposition 65 Product Labeling, Sales Tax Information and Product Recalls for Pressure Washer Equipment.